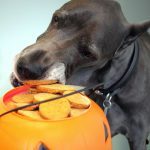 Halloween is a real treat for humans, but not so much for our pets. Did you know that chocolate is toxic to all mammals, but only dogs will eat a potentially fatal amount? The darker the chocolate, the worse it is for a dog, since milk chocolate and white chocolate are diluted with other ingredients.